– Complimentary arrival & departure transfers from the Airport (Dabolim) / Railway station (Thivim, Karmali & Madgao) by an AC vehicle. – Daily Breakfast, Lunch or Dinner on buffet/fixed menu basis as per relevant plan at Balcao restaurant. – Two half-day sight seeing tours of Goa by an AC vehicle. – One hour Boat cruise on any one of the sight seeing day (subject to weather conditions). – Extra Adult / Child rates are for the package duration. – One bottle of Goan wine once during stay. – 20% discount on Beverage during “Happy Hours” in OLA – The Pub. – 15% discount in ZURI – Spa & Salon. – Complimentary use of swimming pool & Gymnasium. – All currently applicable taxes. – Package extendable on pro-rata basis. – All rates are subject to change without prior notice. 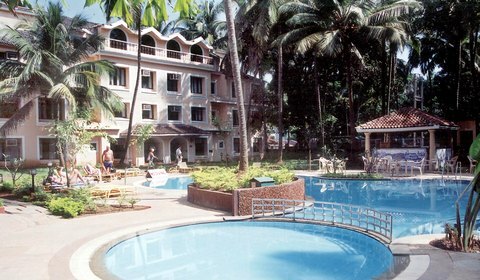 If you have not decided yet or wants to customize tour itinerary or hotels listed above in "Phoenix Park Inn Goa Special Offers Packages from Holiday Time", then we can change the travel itinerary and make a personalized, tailor-made holiday package, especially for you. We can modify this travel package as per your itinerary, budget, duration and the tourist places you would like to visit, including transportation and airfare should be included or not. Please fill the form below to contact us.